Does your dog run off when left to play alone outside? Well, all you need is a good playpen to accommodate your dog. The dog Playpens allow your dog to play and do as many activities as possible without running away. It is an ideal product for all dogs. There are no dull dogs so, don’t have any excuse not to buy one for your dog. There is a wide array of playpens in the market with different appealing designs and features. Playpens are usually made of plastic, steel wire and plastic coating a steel wire. Choosing an ideal playpen for your dog requires deep research to first locate the best models in the market. Well, this is where we come in to help you select the best dog playpen. Let’s have a look into some of the best dog playpens of the year. With each panel measuring 24 inches by 24 inches, Midwest Homes offers you a good place for your dog to rest and play. 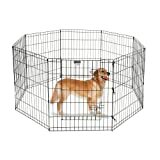 It is a large playpen that gives you a 16 feet space for your dog and other pets. Your dog gets ample space to play and perform various activities. When transporting or storing the playpen, it folds flats. Eight ground anchors ensure it stands firm for outdoor use. Overall, this is a great choice that can withstand the outdoor weather elements. There is an e-coat finish to prevent rust and corrosion. 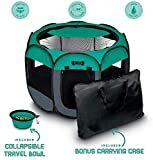 The IRIS is a unique playpen that is 24 inches and with a door for easy dog entry and exit. The dog is closed once the dog is inside. IRIS can be used as a small dog fence, play gate, and a dog play yard. You don’t have to worry about the dog disappearing when inside this playpen. It is a portable option that can be folded and transported when camping with your dog. Dogs get an amazing 8 feet square playing surface to roam as they wish. 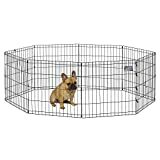 Overall, IRIS is a quality dog playpen made in the USA. The Parkland is a pretty lightweight playpen for your dog that can easily be folded for transportation. It works well both indoors and outdoors keeping your dog happy within an enclosed location. You can set it up in seconds and have your dog inside in no time. Despite being lightweight, it is quite durable and strong. There is a zipper off the top for easy access to your pet inside. Zippered front doors enable your dog to walk in and out with ease. OxGord products are known for the quality, and this Pet Exercise Pen is a good option for your dog to play inside. It is a quality playpen that is collapsible for easy storage and transport. The steel material used to make the pen is coated to prevent rust and ensure longevity and durability. It is a great design ideal for indoor and outdoor use. If you own the large breeds, the Pet Trex is an ideal choice for you keeping the dog enclosed in one place. At 30 inches high, you can be assured your dog will not jump outside. At 24 inches wide, the playpen gives your dog enough playing space. The playpen easily sets and folds up in seconds. There is a secure door and latch for easy access to your dog in and out of the playpen. Ground floor anchors and stabilizer ensure the playpen firmly holds on the ground at all times. If you have puppies and are worried about their safety, BestPet Playpen is your choice. With rounded edges, the playpen is safe for puppies and small breeds of dogs. The edges are round and smooth. There are eight panels to keep the playpen stable. At 24 inches high, you’ve assured the dogs will be safe inside and unable to jump out. The Paws and Pals by OxGord is a convenient space saving design that can be stored with easy whenever not in use. This playpen can easily fold flat and be stored away occupying very little space. With an 8-panel design, it is pretty simple to install in seconds. The materials used to make are comfortable and durable ideal for puppies. The breathable mesh allows free flow of air inside your dog’s playpen. It is a washable playpen making it pretty easy to clean and maintain. This is a safe and comfortable space for your dog to play. The floor of the Unleashed Pets Playpen has been reinforced with an attached floor mat to give the dogs a comfortable playing ground. Interior space is large enough to give your dog enough playing room. Despite being lightweight, it is also strong and durable suitable for both indoor and outdoor use. This playpen is highly portable and requires very little assembly. You can set in seconds and fold it in seconds. 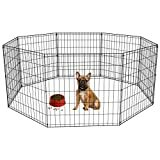 This is our second IRIS product on the list and at number two; it is a pretty nice playpen for your dog. This playpen comes in the octagonal shape and can be used to hold almost any type of pet. 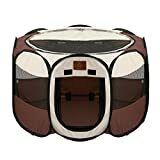 It is highly portable and provides pets with a large 21 square feet playing space. The playpen playing space can be increased by adding the IRIS 34-inches panel. Overall, it is a durable product made in the USA from the heavily molded plastic material. OxGord the trusted name in the industry gives us the best dog playpen of the year at number one with several amazing features. It is a collapsible playpen that sets up in seconds and folds in seconds. This allows for easy transport and storage when not in use. The outer material is rust resistant ensuring durability to the playpen. It is a durable and high-quality playpen ideal for indoor and outdoor use. Don’t let your dog stray away when it can have all the fun inside a playpen. Playpens for dogs are ideal for keeping them entertained indoors and outdoors without straying further away make sure you choose one from the list that best matches your dog’s needs.